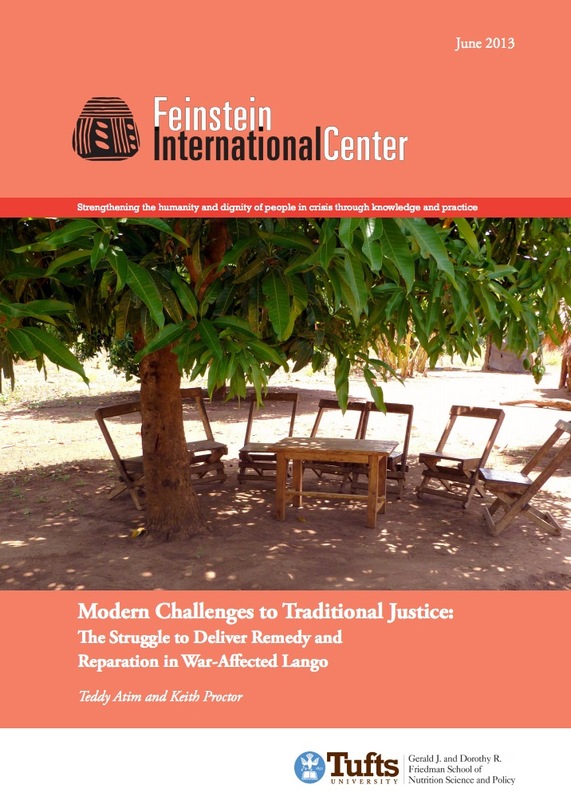 This report is part of a series by Feinstein International Center that examines the impact of armed conflict on civilian populations in northern Uganda and struggles for redress and remedy. Transitional justice mechanisms, including truth telling, reparation and prosecutions, are important processes that can help address past human rights violations and abuses, and can play a role in rebuilding the lives of the affected population and helping a country to move forward. To address the effects of the over two decades of armed conflict between the Government of Uganda (GoU) and Lord’s Resistance Army (LRA) rebel group, the Juba Peace Accords envisioned traditional justice mechanisms as instruments that could help address serious crimes and resulting harms suffered by civilians. However, after detailing the historical evolution of the traditional justice systems and the impact of the war on these systems, this study finds that traditional justice mechanisms are currently unable to fulfill these roles and are not being used to repair victims from harms suffered due to serious crimes committed by parties to the conflict. The report identifies and analyzes efforts by Langi traditional justice mechanisms to address serious crimes and violations committed during the conflict and their result¬ing harms and the reasons why they are unable to offer remedy. The report offers insights into implications for efforts to ensure victims’ rights to remedy and redress are upheld. This report is based on field work conducted with conflicted affected populations in Lango sub region, northern Uganda between the years 2009 – 2011. The Lango sub-region is home to approximately 2.13 million people and is among the sub regions most affected by the GoU and LRA war. We hope the findings of the study will contribute to inform larger transitional justice processes underway in Uganda, in part through addressing the realities and priorities of the affected population.